1. How many cards did he drop? I’d start the class with Estimation 180 Day 4 because Robert Kaplinsky made a good point, will the students ask for the information I’m providing in Act 2? If not, how can we lead them there? The lamppost estimation could get the kids into the needed mindset. A couple sources inspired this task. First, Robert Kaplinsky via Open Middle. Second, Malcolm Swan via a Dan Meyer tweet. 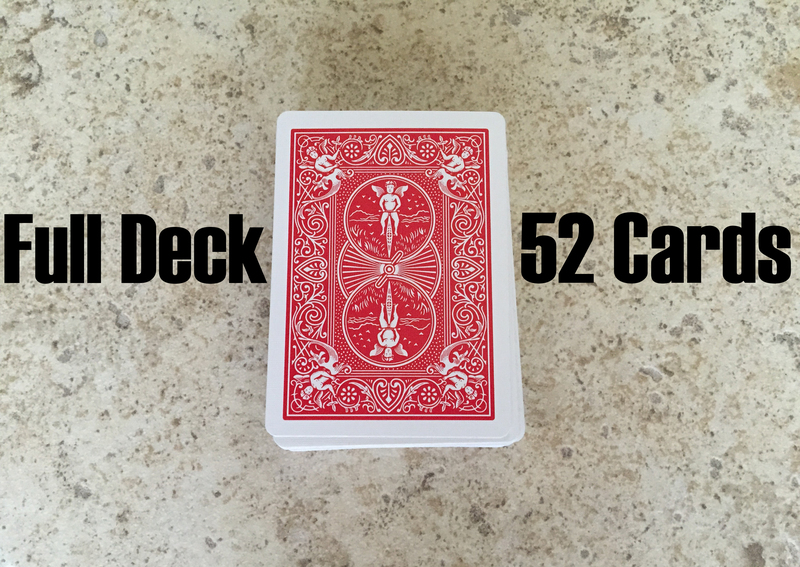 With these in mind, I thought it would be neat for the students to estimate what fraction of the deck was dropped with the following image. From there, they could use the estimate to make a calculation. I’m excited about the possibility of multiple methods including some great visuals. By the way, the students need to know how many cards make up a full deck. No tricks here. After the class works for a while and students are given the opportunity to demonstrate their thought process, the kids can go back and test their work with the actual dimensions. Interesting. I have questions about Act 2. I see where you want the lesson to go. I am wondering what information students will actually ask for. Probably, “How many cards in a deck?”, “How many are in your hand?”, “How many are on the floor?” I am not sure they would ask for information about the stacks of cards’ heights. How do you propose leading them there? Thanks for the comment! Yeah, so they probably won’t ask for what I’m giving them, and I haven’t really thought about how I’d lead them there yet (just really liked the idea shared through your Open Middle problem). Maybe I could ask them if there would be a way to make a comparison since I won’t tell them how many I dropped? Actually, maybe it would be good to start the class with Estimation 180 Day 4. This could get the kids in the mindset of comparing two objects side-by-side. Yeah, that tends to be one of the hardest parts of creating these problems: anticipating how students will interact with the problem and providing enough resources/guidance to allow the teacher to get them to where you want to go. I look forward to seeing what you come up with.